There is nothing like a day in the fresh air to stimulate the appetite and at High Lodge, we have everything you need to satisfy it. Come in for a coffee, a relaxing lunch with friends or perhaps a social drink after your sporting activity in the restaurant at High Lodge. 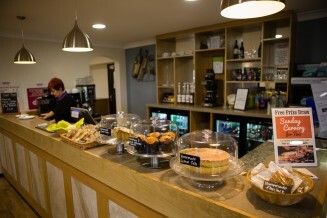 Alternatively why not just drop in for freshly made sandwiches and snacks to eat in or take out. We provide an array of home cooked foods which are freshly prepared by our chefs using locally sourced ingredients where possible. Our breakfast and lunches are available to all from 9am till 2.30pm, 7 days a week. A selection of homemade pastries and cakes are available from our deli bar which offers snacks and lighter options throughout the day until closing. Please click the links below to view menus, dishes of the day and any special offers. Open to all, 7 days a week, no booking required. Large parties and groups are always welcome, although we do advise you to telephone us on +44 (0)1986 784347 to advise us of your visit. If you need to find out more information on any of our dining options, have special requests or to book a table for our Sunday Carvery please call us on +44 (0)1986 784347 or contact us using the on-line enquiry form.